Reaching Haiti through technology . 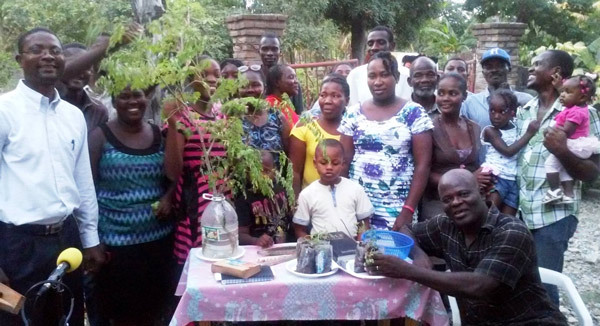 . .
We’ve just completed our first fully-online moringa training with 22 people in the village of Lory, Haiti! Thanks to Pastor Fritzner and his wife, the training drew people from all around the area. The trainees included farmers, teachers, community leaders, pastors, and a school headmaster. The class sat outside under the palm trees in Lory, while we were in our office in Vancouver, Washington. In Lory, there are moringa trees (or Benzolive as they are known there) growing all around, but people just aren’t aware of the rich nutrition that the trees can provide for their families. As we listened to the men and women talk about the serious problems of malnutrition that they face everyday, we were so excited and thankful to be able to share with them the powerful resource that they already have growing in their community. By the end of the training, they were talking about how to add it to their daily diets, how to teach the children in their schools, and were even making plans to start a planting and training team to teach others and transform the village of Lory! This is empowerment at its best!